The Tilt-a-Rack 350RV Scooter Carrier makes transporting mid-sized scooters and power chairs easier than ever. The Tilt-a-Rack Scooter Carrier is easy to install and use. There are no electronic components. Gravity and balance work for you! Perfect for most mid-sized scooters and power chairs. 26" x 52" useable space. All Aluminum Construction makes the 350ARV the lightest choice in it's category. usable area: 26" x 52"
The carrier has a hinging device located just behind the hitch. The hinging device has three positions. Each position uses a 5/8" pin. The first position keeps the rack locked in the horizontal position. The second position allows the loaded scooter rack to lift and float over dips and curbs. The third position will permit you to store the rack in a vertical position. The leveling bolt on the frame beneath the platform keeps the carrier level for each type of vehicle and levels the center of gravity of the many types of chairs and scooters. The tilt feature eliminates the need for ramps. With the flip of a latch, the rack tilts easily toward the passenger side. It conveniently reaches the curb for parallel parking. The deck extender pulls out from beneath the scooter, reducing the angle of incline. This feature is especially helpful when a handicap curb is not available. The two set bolts eliminate the minute movement of the hitch bar when inside the hitch receiver. 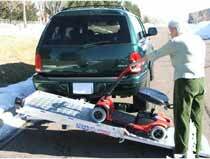 They are tightened to the face of the receiver immediately after you attach the carrier to your vehicle. Works with a 2" class III hitch (standard). For low or smaller vehicles, add the height-adjustable Class II or III hitch bar.